Sunday 8/6 Trip on the Independence II to the Resor. The surface temp was 70+ while the bottom was 47. Highlights include: 40-50 ft of visibility, 30 some big lobster, scallops, enormous Tautog, and a great wreck for us sightseers. 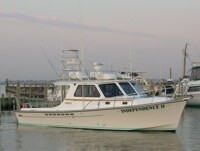 We jumped aboard the Divers Den North charter on the Independence II. Our destination was the Resor. All of my previous attempts to dive the Resor had been blown out, so I was very happy with the marine forecast for the weekend. Given the distance offshore, we gathered early at the dock. The trip out was in 2-3 ft of long period chop, which died down as the day wore on. The sky was clear with a slight east breeze that cooled us off. We could not have asked for a nicer day. Captain Dan lined us up on the stern section of the wreck. Paul jumped in and had us tied in 5 minutes or less. Most of the group jumped in looking for lobsters and scallops. This was my first time here, so when I hit the wreck with 50 ft of vis, I just took the 50 cent tour. The tie-in was at 80 ft, and the bottom at 120-130. There was a very mild current. With this vis, you could see the bottom from the tie in. It took all of the first dive to circle the stern. It was a leisurely swim around the structure hovering about 20 ft off the bottom. I could see divers below hunting for bugs. Paul was nice enough to tied off the far end of his reel by the deck gun, leaving his reel there to aid the sightseers. After passing that, I was looking into each hole we passed. Lots of fish were hiding inside the wreck, as well as swimming on the down current side. 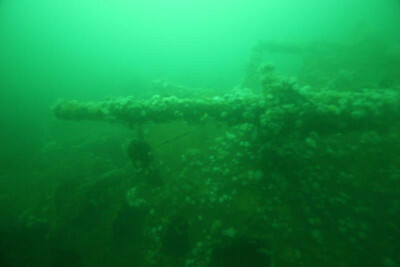 The wreck is covered with flowing anemones. In the mild current they were all out swaying in to and fro. Just an incredibly picturesque dive! There was a bit of a current between 50ft and 20ft as we came up the line. Nothing unmanageable, but it left me wishing I had brought a John-line. When I got back on board, I was amazed to see the number and size of the lobsters that came up, but no scallops on this dive. The other divers were banding their catch and covered the bottom of the big cooler. Bullet shell casings were apparently found on the bottom by many of the divers. Paul explained the structure of the wreck, and how to get to the bow section by passing over the debris field. After a good surface interval of swapping stories, it was time to see the rest of the wreck. I tied a reel by the line, and headed out over the debris field. Hovering above the wreck gave a great panoramic view. The debris was scattered with large open scallop shells and clam shells were also common. Ling cod swam about as well as some large Tog. Here and there were some seabass. Arriving at what I believe was the bow, there were several places where rope was a tell tale sign of previous dives. The section was full of large holes deep into the structure exposing the decks below. I caught a glimpse of a very large Tog gliding slowly away from me around the hull. Sorry, no weapon in hand. On the way back to the line, I was escorted by a large Monkfish which happened to be swimming in the same direction. Unlike most fish, he seemed to be oblivious to my light. While unclipping the reel there was another very large Tog gliding about the top of the stern. There were a few minutes of planned bottom time left, so I stalked him as he passed in and out of the wreck. Back on the line, the current had died down a bit, making the hang more comfortable. I could see lobsters and scallops in the catch bags above me. Alas, mine was empty. Again I boarded the boat to see divers loading the cooler with more lobster. The final count I heard was 30. While other divers had quite a few, but I think the Bill Trent, of Adventure Scuba fame, had the most big bugs + scallops. Paul Wittaker was already in the water to take a few pictures and then pull the “hook”. We were quickly underway. Before long, everyone had found a spot to take a quick nap on the hour + trip to the marina. The skies were still clear as we unloaded our gear and headed home thinking “What a great day”! Saturday 8/5 Trip on the Independence II to the Stolt. The surface temp was 75+ while the bottom was 50. Highlights include: 30ft of visibility, lobster, scallops, mussels, mermaids and delivery service???? Something’s not right! The crew from Adventure Scuba of Conshohocken, PA headed out on the Independence II to the Stolt Dagali. Always looking to clock some more time on my KISS rebreather, I joined the trip. When we arrived at the wreck, there was a dive boat already tied in. Since their group was finishing up their first dive, they offered to share the wreck. The timing worked out well as they would be doing their surface interval while we dove and vise versa. Bill Trent was crew this day. Since he and I have buddied up on previous dives, I was planning to jump in with him, help tie, then do our dive. With the other boat in place, the plan changed. We could not drop a line, so Bill swam the chain down the other boats line. Divers coming up gave us quite a puzzled look as we went by. Bill was Open Circuit and I was CCR, so he could drop down the line much quicker than I could. I was really no help at all. He quickly found a spot to tie in, as I was still getting neutral. I arrived just in time to send up the signal. We headed down to the sand to look around. Winter flounder where so thick you could not swim more than a foot or two without scaring one away. Some were so large, I thought they were fluke. Unfortunately they stirred up the bottom as they left. Lobsters were abundant, and even I was able to get my hands on a few. Mine were on the short side though so I left them to scurry back to their holes. Bill had a few nice bugs in his bag, and was now fighting with a big one, deep under the wreck. I could not see him through the silt, but on occasion I caught a glimpse of the glow of his bright 21 watt HID. Eventually he was the victor. He emerged from the silt and gave the signal to head up. We did not have a scale, but I’d guess the bug was in excess of 3lb. Some of our divers were just headed down as we went up the line . Only the crew was left on the boat as we arrived. Before long, bikini clad women started swimming by the boat. Is this normal on your dive trips? As it turned out, the other boat was chartered by an all women dive group out of New York. Several members of the group knew Captain Dan and Captain Jay, and have been on the Independence before. With the boats only 30 some feet apart, and the water temp near 80, they decided to stop over to say hi. The divers on our boat were all men, and the boats were tied into the wreck close together. You can imagine the confusion as our divers climbed up the ladder to see women aboard. After the first double take, many had to check the large letters on the stern, clearly spelling out “Independence II”. Yup, this is the right boat. Shortly the other boat started up their grill and we were awash with the smell of barbecue. More and more women stopped by mentioning that there was a huge spread of food aboard, far too much for them to finish. Before long the ladies graciously stopped back with some of the leftovers: ribs, chicken, salsa, chips, salad and finally margaritas all wrapped in Ziploc bags. This was the first time I’ve seen food delivered on the Stolt. It was all quite tasty, and after smelling the barbecue for the last hour, we were getting very hungry. The margaritas would have to wait for the end of the second dive. We headed in for a quick dive, and then to pull the hook. Dave had seen a large lobster in a pipe below our line. Bill and I looked for it, but with no luck. We circled around the side of the wreck into the current. Bill picked up a few more lobster before we headed up to untie. I tried to provide some assistance this time by getting some slack on the line. A few seconds latter and we were flying over the bottom. We scurried up, did our hang, and boarded the boat. We were quickly on our way back from one of the more memorable diving days. Thanks, ladies for stopping by. It was good to meet you, and the food was great. Whoever made those ribs, they were fantastic! This is one diving day we’ll be talked about for a while.